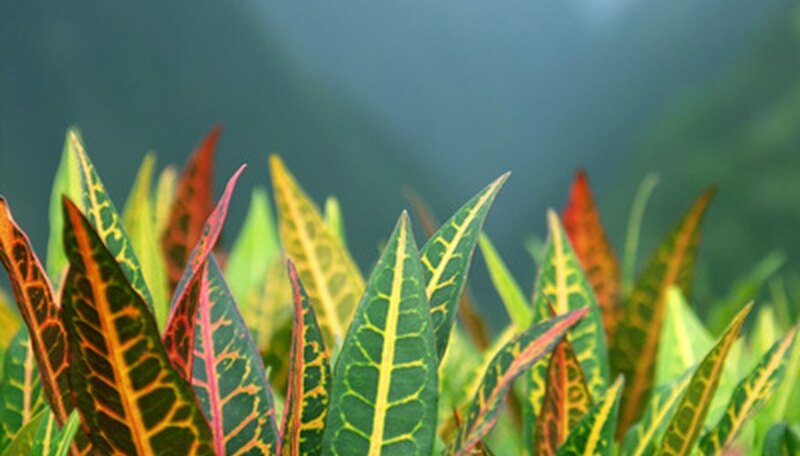 The croton (Codiaeum variegatum) is a tropical, leafy plant, prized for its colorful, variegated foliage. Because of their cold tenderness, crotons have become popular houseplants in non-tropical regions. Crotons are easy to grow and can have leaf colors ranging from green mixed with yellow, to bright red or purple. Crotons are divided into different categories based on the characteristics of their leaves, particularly their leaf shapes. The broadleaf type is the most common type of croton. It has the largest and broadest leaves of all the croton types and the group includes the Charles Rutherford, Ben Alexander and Seminole Queen crotons. The oak leaf croton has lobed leaves that are extremely similar to those of the oak tree. The semi-oak leaf croton has less distinct lobes, with many variations on the oak leaf form. Some examples of these croton types are the Irene Kingsley, carrot, exotica and Ann Rutherford crotons. The spiral leaf croton has twisted leaves. One example of a spiral leaf type is the Rex croton. The narrow leaf croton has long leaves with a width of only 2 to 4 inches. The length of the leaves is often two to four times the width. The very narrow leaf croton has long, drooping leaves that are just 1/2 inch wide or narrower. Narrow leaf and very narrow leaf crotons include the borgorienses, Picasso’s paintbrush, coral shower, Carmen Christian and stoplight crotons. The small leaf type of croton has leaves that are 2 inches long or less, but that are the same overall shape as the broad leaf croton. The red thia is a small leaf croton. The recurved leaf crotons are the rarest type, with leaves that curl back toward the center of the plant. The interrupted leaf croton is an unusual type, with leaf blades that stop for 1-inch sections, the entire leaf connected by the midrib, or central leaf vein. United States Department of Agriculture: Plants Profile -- Croton L.